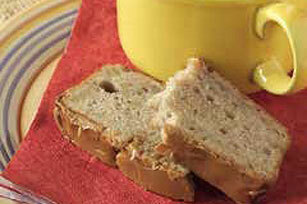 Try our Simple Banana Bread Recipe for an easy dish coffee lovers will enjoy. Our Simple Banana Bread Recipe includes a glaze of coffee and powdered sugar. Preheat oven to 350°F. Beat butter and granulated sugar in large bowl with electric mixer on medium speed until light and fluffy. Add bananas, egg and lemon juice; mix until well blended. Mix flour, baking powder, cinnamon and salt. Gradually add to banana mixture, mixing well after each addition. Pour into greased 9x5-inch loaf pan. Bake 1 hour or until bread springs back when lightly touched. Cool 10 min. ; remove from pan to wire rack. Cool completely. Dissolve instant coffee in hot water in medium bowl. Add powdered sugar; beat until well blended. Drizzle over bread. Cut into 16 slices to serve. Add 1/2 cup chopped PLANTERS Walnuts or BAKER'S ANGEL FLAKE Coconut to the glaze mixture before drizzling over bread. Makes 16 servings, 1 slice each.